Seek To Know The Truth: An Updated Version of the Ten Commandments? God’s very own words, which He Himself commanded not to be changed, are now being “updated” and preached by hundreds of churches across Great Britain. Instead of the Ten Commandments, they are calling it “Just 10”. The new vows include “manage your anger”, “know God”, and “catch your breath”. “Thou shalt not steal” has become “prosper with a clear conscience,” and “Thou shalt not take the Lord thy God’s name in vain” becomes “take God seriously”. 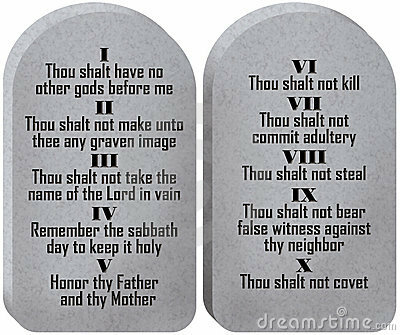 The Ten Commandments have been re-written to reflect modern values. Where does this fall in the Biblical teaching that “You shall not add to the word which I command you, neither shall you diminish ought from it, that you may keep the commandments of the Lord your God which I command you” (Deuteronomy 4:2)? Is this a very subtle way of rewriting the commandments of God? And what is this going to say for the next generation of Christians or at least “professing” Christians? Through the 20th century, there has been a progressive “paraphrase” of the Word of God that has happened through the development of all the newer Bibles. The greater agenda is to one step at a time change the Word of God through progressive modernist translations. So that eventually, the original words of God will become unrecognizable – making the Bible a “paraphrase” and a series of philosophical ideas. The Word of God is alive and powerful and when it is preached, it breaks through the heart of man and overthrows the lies of Satan. This is a progression of trying to overthrow the word of God by turning it into a loose paraphrase and in doing that, it’s a betrayal of what God commands. The idea is “well, we need to update and modernize it so it can relate to a modern audience”. That’s not what needs to happen. What needs to happen is that our licentious modern audience needs to repent of these modern philosophies that they have been corrupted by and turn back to the true word of God – turn back to the faith that was once delivered unto the saints 2,000 years ago. “Thus saith the Lord, Stand ye in the ways, and see, and ask for the old paths, where [is] the good way, and walk therein, and ye shall find rest for your souls” (Jeremiah 6:16). The very next line says “But they said, We will not walk [therein].” … Is that what’s happening in America and around the world? “Behold, I will certainly bring calamity on this people—The fruit of their thoughts, Because they have not heeded My words Nor My law, but rejected it.” (Jeremiah 6:19). It’s the whole idea of trying to be cool – bringing God down to our level. We don’t need God to come down to our level – that happened when Jesus became a man. But He came to call us out of this world, not to conform to it – we need to become more like God. We need to be transformed by the power of God through faith in the Lord Jesus Christ. Don’t be deceived by the spirit of anti-christ.